It's always a nice feeling to see this flag flying and realize I'm at home. (click to see larger)To celebrate the birth of my country, there's one tradition that we like to follow: blow things up. That's right, on the 4th of July everyone takes the day off so we can remember those great people who declared us an independent nation more than 200 years ago, and then we like to have a party. We grill food, watch baseball, and, most importantly, set off fireworks. Hard to see, but that's an American flag on a burned hill in Colorado Springs. (click to see larger)I suppose when you're in a state that's so dry it has been burning for weeks, you get a little bit sick of anything containing the word "fire". In what seems to be a fair rule, fireworks are banned this year. Our night skies weren't lit up with colorful explosions. This isn't completely different from normal years. Private fireworks have been illegal in Colorado just about every year I've lived here. I think that law is what keeps the Wyoming economy alive since the Colorado natives have to hop across the border to buy them. They're not illegal in Wyoming because there's nothing to burn down. As a matter of fact, that state might not have any actual residents - just people from Colorado who commute to run fireworks stands every morning. Anyway, how do you celebrate without fireworks? I drank beer and watched baseball. Does that cover it? I spent last 4th of July in eastern Hungary where I was educating a Hungarian girl about the traditions. Without a barbeque grill, I cooked hamburgers on the stove. It was absurd how much I paid for "American Hamburger Buns," but it seemed necessary. They actually turned out pretty good. Since a girl was helping me, I even neglected to burn them like I usually do. With no patriotic tunes on the Hungarian radio, I was forced to turn to YouTube for the soundtrack. Everything went well, except there weren't any fireworks. A deer enjoying the freedom to eat plants right in front of our fence - apparently I'm not intimidating when holding a camera. (click to see larger)That's why this year seemed so exciting. I would be in my native land with other people who cared about the day. I'd hear the same old songs while eating the same old food and watching the same old fireworks. 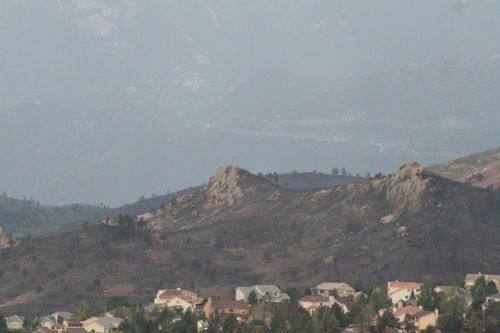 After watching the city burn and seeing smoke still coming off the mountains, it didn't seem right to have a barbeque. So, we headed to a restaurant. In a grand sense of irony, we went to what I thought was an American restaurant, but the pictures on the wall looked just like communist murals. Last year: 4th of July in Hungary with American songs and hamburgers. This year: 4th of July in Colorado with communist paintings and no fireworks. Sometimes I just don't understand my life. Does travel bring me closer to home? Or, do I just have my head screwed on backwards? My mom loves the flowers that she can hide from the deer and other animals, and they help me remember it's summer. (click to see larger). I don't know it, and I left my dictionary in Hungary. If you know it, help me out.